In previous posts I have discussed three poets — Walter E. Piatt, Paul Wasserman, and Elyse Fenton — who explore how the contemporary wars have wrought alterations of perspective and emotion on those who fight them and those who have been affected by them. 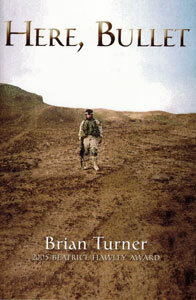 Below I offer a few comments on Brian Turner, by far the most well-known and important of contemporary war poets. small as match heads burned down to embers. Has this year made me a better lover? that any of it made sense? I have no words to speak of war. I never dug the graves of Talafar. I never held the mother crying in Ramadi. when they carried him home. orange groves with ice forming on the rinds of fruit. of the dust of bones, and nothing more. Subtract each sound. Subtract it all. below the threshold of human hearing. like spiders over a film of water. as all of Baghdad listens. when pressed lightly to her forehead. the hush we have been waiting for. the brain's landscape equal to the stars. Turner poems record such facts of modern war experience as IEDs, women in uniform, “enhanced interrogation techniques,” and PTSD, but the characteristic most worth mentioning in conclusion is his deep interest in history. Turner’s not particularly interested in politics and his sense of the war’s ethical dimensions is expressed obliquely. He is, however, ever conscious that the Iraq soil on which he fought had a long, richly-recorded existence before America turned it into a 21st century battleground. This pre-history of Operation Iraqi Freedom wells up in Turner’s poetry in the form of references to ancient texts, images of ghosts, evocations of ancestors, and readiness to consider contemporary events in a temporal context extending deep into the past and into the future. To sand go tracers and ball ammunition. To sand the green smoke goes. Each finned mortar, spinning in light. Each star cluster, bursting above. To sand go the skeletons of war, year by year. the way dreams burn in the oilfires of night. Turner, the first or near-first Iraq veteran to turn his war experience into verse, has established an impressive standard of both poetic craft and thematic depth for the poets who have followed him. I highly encourage everyone to read Here, Bullet and Phantom Noise cover-to-cover to fully experience Turner’s stunningly imagined representation of how the war in Iraq was fought and how it was felt. This post previously appeared in altered form on Thomas Ricks’ Foreign Policy blog The Best Defense. Here, Bullet was published in 2005 by Alice James Books. 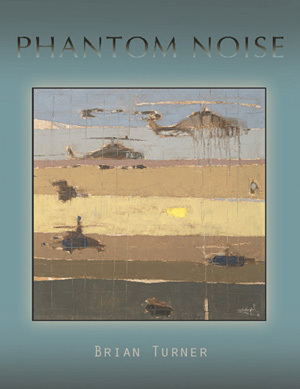 Phantom Noise was published in 2010 by Alice James Books. This entry was posted on April 8, 2013 at 8:04 pm and is filed under Art and War. You can subscribe via RSS 2.0 feed to this post's comments.